The JBoss Integration Plug-in for the IntelliJ IDEA, Part 1.
will lie about other things as well. This paper describes the use of a new plug-in that eases the integration of a popular IDE, called IntelliJ with a popular open-source application server, called JBoss. This paper describes the installation and use of the JBoss plug-in with the IntelliJ IDE. The JBoss integration plug-in was first conceived and implemented by Martin Fuhrer at Fuhrer Engineering. It is typical for enterprise systems to be run on multiple computers. For example, a web server, an application server and a development machine are often run on three different computers. The web server’s primary goal is to quickly serve static data (HTML, images, audio, etc.) to a browser, over the Internet, using HTTP (Hypertext Transfer Protocol). This is typically done in a stop-and-wait protocol, and as such, throughput during the waiting period drops to zero while a request is processed. Thus, there is a distinct advantage to minimizing processing time for HTTP requests in order to provide a positive experience for the web client. The application server’s primary goal is to run programs that create dynamic data (servlets, JSP’s, EJB’s, etc.). This is typically done using a framework based on a large, and sometimes computationally cumbersome, API. Part of the API may be sourced from a vendor (like Sun), but often the API contains custom business logic that was authored by in-house programmers. As a result, the speed of execution of methods in the application server, as well as their reliability, may not be at the same standard as a more widely available API. Typically, systems run daemon tasks in order to handle requests for services. They are often started by a single task that runs multiple threads, thus enabling fast context switching (due, in part, to the shared memory architecture used by multi-threaded systems). Even so, a few slow threads can make a task, and even a whole computer system, seem sluggish. The development machine is generally under direct control of a programmer. During the process of development, machines can crash, or be deliberately rebooted. Bugs can be introduced into code that cause slow-downs and the development environment itself can cause a major computational load. The environment of having one-programmer with one application server may prove to be increasingly rare in an industrial setting. Frequently, there will be multiple programmers and several application servers, some of which are development machines, and others that are live (i.e., production machines). This is illustrated in Figure 1. Figure 1 depicts an oversimplification of an enterprise architecture. There are frequently large repositories of company proprietary data in relational database management systems (RDBMS) as well as firewalls, perimeter networks, bastion (i.e., DMZ) machines, etc. One of the basic questions is “why JBoss?” There are many application severs on the market, and JBoss is just one of many, as documented in [Lyon 2004]. Some of them are even free and open-source. However, JBoss has doubled in popularity between 2002 and 2003, taking over 26% of the application server market [BUSINESS WIRE 2004]. 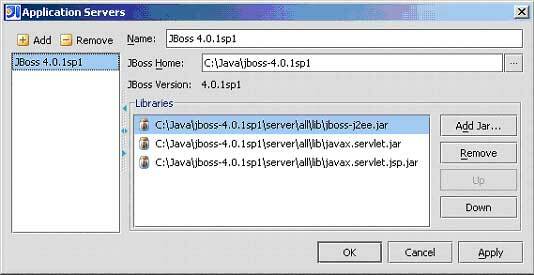 The remainder of this article will address how to install the JBoss plug-in, and create an IntelliJ IDEA project using JBoss as the application server. This section describes how to download and install the JBoss plug-in. From the IntelliJ IDE, select the File:Settings menu item, then select the Plugins icon, as shown in Figure 2.1. The Plugins dialog displays two tabs. Select the Available tab and accept the prompt to download latest repository information. 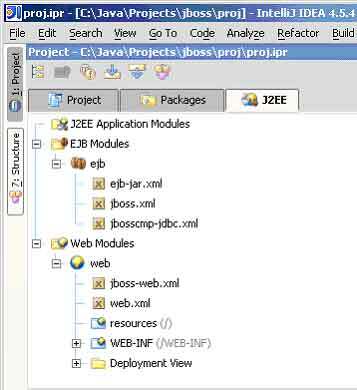 Sort the list of plug-ins by category, proceed to the J2EE category and select JBoss as shown in Figure 2.2. Right-click and Select Download and Install Plugin. Accept the prompt to install the JBoss plug-in. 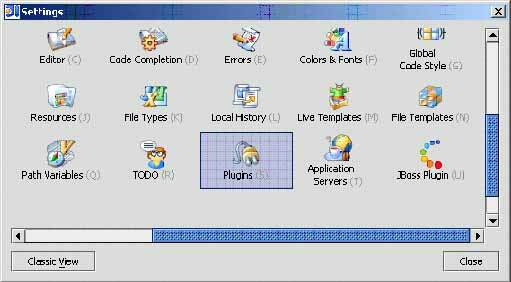 A dialog will appear that says “you need to shut down the IDE to activate the plug-ins”. Select Yes and the IntelliJ IDE will shut down. Restart the IDE and you are ready for the next section. Once the JBoss Server is selected, its home location must be identified to the IDE. JBoss can be run remotely on another machine; however, there are libraries that are required in order for compilation to work. These libraries must be on the local (i.e., developer’s) machine. Select the JBoss home, as shown in Figure 3.2, and select OK. The Application Servers dialog shows the location of the libraries (needed for a successful linkage). Select OK to finish. 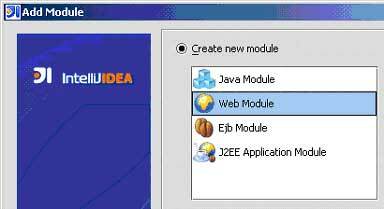 This section describes the procedure for creating a multi-module project that contains both an EJB and a web module. From the IntelliJ IDE, select the File:New Project menu item in order to bring up the New Project dialog. Set the project file name and location, As shown in Figure 4.1. Accept any prompts to create the project directory. Select Next, select/configure the project JDK (not shown here) and select Next again. Select the Create/configure multi-module project radio button, as shown in Figure 4.2. Selecting Finish will display the Add Module dialog. You are now ready to add an EJB Module. Select Create new module - Ejb Module as shown in Figure 4.3. Select Next and enter in the module name, as shown in Figure 4.4. Select Next through the next set of screens (the defaults should be acceptable) and then select Finish. This will reveal the Paths dialog, as shown in Figure 4.5. Select Add in the Paths dialog and select Web Modules as shown in Figure 4.6. Select Next and enter in the module name, as shown in Figure 4.7. Select Next through the next set of screens (the defaults, as they appear, are typically reasonable), and then select Finish. This will return you to the Paths dialog, as shown in Figure 4.8. Selecting OK will save your settings, close the Paths dialog, to return you to the project window. The J2EE tab will enable a project windows display that now shows the new files, as shown in Figure 4.10. The JBoss plug-in is freely available and its download is integrated into the IntelliJ IDEA IDE. In this paper we discussed how to download and install the JBoss plug-in, allowing the JBoss application server to integrate into the IntelliJ IDEA development environment. 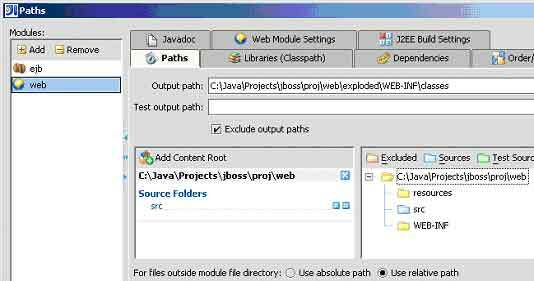 We created a project with EJB and web modules, and marked the EJB module as a web module dependency. In Part 2 we will describe how to add a session bean, implementing a local or remote interface to our bean. [Lyon 2004] Java for Programmers, by Douglas A. Lyon, Prentice Hall, 2004. Available from http://www.docjava.com.